Since our inception in 2005, we have accumulated profound expertise in a variety of video-related domains, including OTT (both live streaming and on-demand), IPTV, mobile video, VR and 360° video, as well as gaming consoles, STBs, and smart TV platforms. Our сustom OTT platform development know-how was instrumental in helping global brands envision, design, and deliver innovative video solutions. We’ve had the privilege of working with clients such as Vodafone, Telecom Argentina, and Discovery Communications to build cutting-edge OTT solutions from scratch, as well as retool existing systems to enhance them in terms of UX, content protection and security, multi-screen support, monetization options, and more. Now we can do the same for you. Whether you are an established player in need of video platform-related services, or a start-up trying to push the envelope building the next big thing in online video, we are here to help. Whatever your OTT development needs are, we will help you build a superior online video solution designed to engage your audiences, increase revenues, and ensure a high ROI. Contact us now, and a video technology expert will get back with you as soon as possible. Are you relying on an existing video platform or media streaming server? If so, we would be happy to provide professional custom development services to further enhance your platform of choice and increase its business value. Leverage our skills to build highly usable, professional-looking UIs for a variety of screens and devices. 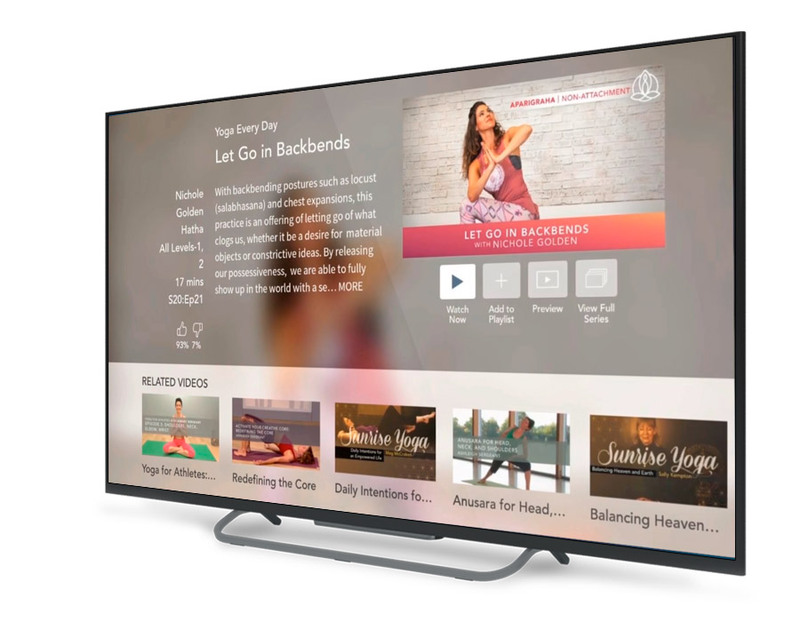 We cover responsive web, mobile, connected TVs, set-top boxes (such as Apple TVs and streaming sticks), and more. We are experts in industry-standard encoding and transcoding tools and tech stacks designed to ensure your video is delivered in the right format. FFmpeg, encoding.com, Amazon Elastic Transcoder — we know the drill. Use our domain know-how to implement complex business logic around various payment models. Think subscription-based, transactional, or ad-supported video offerings, coupon and discount functionality, and more. Ensure a steady cash flow via advanced video advertising and monetization capabilities. From server­side ad insertion (SSAI) to third-party integrations with providers such as FreeWheel or DoubleClick — we got your back. Make sure your premium multimedia content is 100% safe. We are experts in integrating content encryption and studio-approved digital rights management solutions such as PlayReady, Widevine, and FairPlay. Implement advanced user and group management features to ensure the right people have access to the right content. Bolster customer relationships and increase user loyalty with powerful CRM and customer care capabilities. Use our Big Data and Business Intelligence know-how to develop state-of-the-art video analytics or integrate with market leaders like comScore, Nielsen, and Rentrak. Use data-driven insights into user behaviors to make informed decisions and one-up the competition. Ensure smooth video delivery to customers around the world, on any device. Let us worry about cloud deployments, CDN integration, and the right media streaming standard such as HLS, MPEG-DASH, or RTMP. Utilize our software architecturing knowledge to determine the best way to create your OTT platform in terms of performance, scalability, and maintainability. Leverage our frontend talent and UX development expertise to build stunning user experiences on every device and resolution — from iOS- and Android-based smartphones to STBs and gaming consoles. Use the power of our backend specialists to build robust APIs, security, or user management features. Whether it’s Java, .NET, PHP, or Ruby — we have the know-how and a winning “can-do” attitude to help you succeed no matter how challenging the requirements are. Ensure superior product quality with our dedicated manual testing and QA automation services. Test complex business logic, increase test coverage, and reduce time to market by automating your QA efforts. We have built several custom OTT solutions from scratch and are experts in customization and enhancement of 30+ market-leading video platforms and streaming servers. We have a well-defined yet flexible Scrum process in place to ensure even a major undertaking like building a brand-new OTT platform can be carried out in a predictable, low-risk manner — without sacrificing speed of development or time to market. Throughout the years, we have helped industry leaders such as Vodafone and Discovery Communications to create state-of-the-art video solutions designed to take the market by storm. Capitalize on our OTT expertise to leave the competition in the dust. We are here to help you with your online video development needs. Let’s connect and turn your big idea into reality!